The genus Aspergillus includes over 185 species. Around 20 species have so far been reported as causative agents of opportunistic infections in man. Among these, Aspergillus fumigatus is the most commonly isolated species, followed by Aspergillus flavus and Aspergillus niger. Aspergillus clavatus, Aspergillus glaucus group, Aspergillus nidulans, Aspergillus oryzae, Aspergillus terreus, Aspergillus ustus, and Aspergillus versicolor are among the other species less commonly isolated as opportunistic pathogens. Aspergillus is a group of molds which is found world-wide, especially in the autumn and winter in the Northern hemisphere. The fungus also causes allergic diseases in asthmatics and patients suffering from cystic fibrosis. 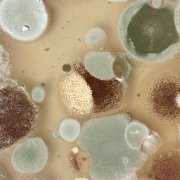 The fungi (mold) that produce aflatoxins can infect important food and feed crops before, during and after harvest. These fungi, especially Aspergillus flavus and A. parasiticus, are normal soil-borne inhabitants in our environment, growing on both living and decaying plant matter. Mycotoxins include metabolic by-products produced by a number of different fungi that may or may not be toxic. One of the mycotoxins, aflatoxin, is produced by the fungi Aspergillus flavus and Aspergillus parasiticus. Four different aflatoxins, B1, B2, G1 and G2, have been identified with B1 being the most toxic, carcinogenic, hepatotoxic and potentially mutagenic, while also being the most prevalent. Many common household foods are also manufactured by the aspergillus fermentation process. This can also be unhealthy for already compromised individual who has been exposed to aspergillus in high counts to be in contact with. It is recommended that these products be avoided at all costs. The type of diseases caused by Aspergillus are varied, ranging from an “allergy”-type illness to life-threatening generalized infections. Diseases caused by Aspergillus are called Aspergillosis. The severity of Aspergillosis is determined by various factors but one of the most important is the state of the immune system of the person. To furthermore understand the significance of the component aflatoxin as a known carcinogen by the government, review the following expert on Iraq’s declaration of biological weapons in 1998 according to this SIPRI fact sheet, The discovery that Iraq was researching aflatoxin, not a traditional BW candidate, was a cause for some surprise. It is a carcinogen, the effects of which manifest themselves only after many years, and several Western experts have rationalized this Iraqi programme only in terms of genocidal goals. If aflatoxin were used against the Kurds, for instance, it would be impossible definitively to prove the use of BW once the symptoms emerged. Another possible explanation is its potential use as an immune suppressant, making victims more susceptible to other agents. However, the aflatoxin declaration may also hide other aspects of Iraq’s BW programme: according to Iraq’s depositions, the production programme never encountered any mishap (as other parts of the BW programme had) and, to judge from the declared time-frame for the total amount produced, production could never have stopped, even for cleaning of the equipment. This raises the suspicion that Iraq declared an excessive amount of aflatoxin in order to disguise the fact that other, more destructive agents had been produced in greater quantities. Aspergillosis is a large spectrum of diseases caused by members of the genus Aspergillus. The three principal entities are: allergic bronchopulmonary aspergillosis, pulmonary aspergilloma and invasive aspergillosis [see below]. According to a recent Mayo Clinic study, one in seven Americans suffers from acute fungal sinusitis. These numbers are sounding alarming. Colonization of the respiratory tract is also common. Lowered host resistance due to such factors as underlying debilitating disease, neutropenia chemotherapy, disruption of normal flora, and an inflammatory response due to the use of antimicrobial agents and steroids can predispose the patient to colonization, invasive disease, or both. 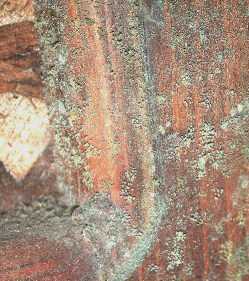 Aspergillus spp. are frequently secondary opportunistic pathogens in patients with bronchiectasis, carcinoma, other mycoses, sarcoid, and tuberculosis. This is a condition which produces an allergy to the spores of the Aspergillus molds. It is quite common in asthmatics; up to 20% of asthmatics might get this at some time during their lives. ABPA is also common in cystic fibrosis patients, as they reach adolescence and adulthood. The symptoms are similar to those of asthma: intermittent episodes of feeling unwell, coughing and wheezing. Some patients cough up brown-colored plugs of mucus. The diagnosis can be made by X-ray or by sputum, skin and blood tests. In the long term can lead to permanent lung damage (fibrosis) if untreated. This is a very different disease also caused by the Aspergillus mold. 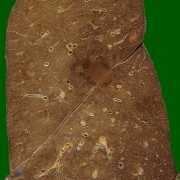 The fungus grows within a cavity of the lung, which was previously damaged during an illness such as tuberculosis or Sarcoidosis. Any lung disease which causes cavities can leave a person open to developing an aspergilloma. The spores penetrate the cavity and germinate, forming a fungal ball within the cavity. The fungus secretes toxic and allergic products which may make the person feel ill. The person affected may have no symptoms (especially early on). Weight loss, chronic cough and feeling rundown are common symptoms later. Coughing of blood (hemoptysis) can occur in up to 50-80% of affected people. The diagnosis is made by X-rays, scans of lungs and blood tests. Many people have died from severe invasive Aspergillosis. Their chances of living are improved the earlier the diagnosis is made but unfortunately there is no good diagnostic test. Often treatment has to be started when the condition is only suspected. This condition is usually clinically diagnosed in a person with low defenses such as bone marrow transplant, low white cells after cancer treatment, AIDS or major burns. There is also a rare inherited condition that gives people low immunity (chronic granulomatous disease) which puts affected people at moderate risk. People with invasive Aspergillosis usually have a fever and symptoms from the lungs (cough, chest pain or discomfort or breathlessness) which do not respond to standard antibiotics. X-rays and scans are usually abnormal and help to localize the disease. Bronchoscopy (inspection of the inside of the lung with a small tube inserted via the nose) is often used to help to confirm the diagnosis. Sometimes the fungus can transfer from the lung through the blood stream to the brain and to other organs, including the eye, the heart, the kidneys and the skin. Usually this is a bad sign as the condition is more severe and the person sicker with higher risk of death. However, sometimes infection of the skin enables the diagnosis to be made earlier and treatment to be started sooner. Many people die from invasive Aspergillosis. Their chances of living are improved the earlier the diagnosis is made but unfortunately there is no good diagnostic test. Often treatment has to be started when the condition is only suspected. This condition is usually clinically diagnosed in a person with low defenses such as bone marrow transplant, low white cells after cancer treatment, AIDS or major burns. There is also a rare inherited condition that gives people low immunity (chronic granulomatous disease) which puts affected people at moderate risk. People with invasive Aspergillosis usually have a fever and symptoms from the lungs (cough, chest pain or discomfort or breathlessness) which do not respond to standard antibiotics. X-rays and scans are usually abnormal and help to localize the disease. Bronchoscopy (inspection of the inside of the lung with a small tube inserted via the nose) is often used to help to confirm the diagnosis. 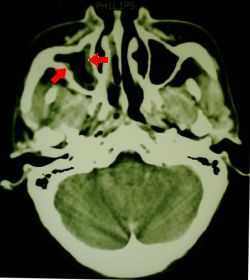 Aspergillus disease can proliferate in the sinuses leading to Aspergillus sinusitis. In those with normal immune systems, stuffiness of the nose, chronic headache or discomfort in the face is common. Drainage of the sinus, by surgery, usually cures the problem, unless the Aspergillus has entered the sinuses deep inside the skull. Then antifungal drugs and surgery is usually successful. Aflatoxicosis is poisoning that results from ingestion of aflatoxins in contaminated food or feed. The aflatoxins are a group of structurally related toxic compounds produced by certain strains of the fungi Aspergillus flavus and A. parasiticus. Under favorable conditions of temperature and humidity, these fungi grow on certain foods and feeds, resulting in the production of aflatoxins. 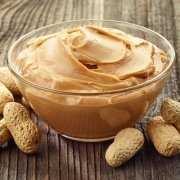 The most pronounced contamination has been encountered in tree nuts, peanuts, and other oilseeds, including corn and cottonseed. The major aflatoxins of concern are designated B1, B2, G1, and G2. These toxins are usually found together in various foods and feeds in various proportions; however, aflatoxin B1 is usually predominant and is the most toxic. When a commodity is analyzed by thin-layer chromatography, the aflatoxins separate into the individual components in the order given above; however, the first two fluoresce blue when viewed under ultraviolet light and the second two fluoresce green. Aflatoxin M a major metabolic product of aflatoxin B1 in animals and is usually excreted in the milk and urine of dairy cattle and other mammalian species that have consumed aflatoxin-contaminated food or feed. Aflatoxins produce acute necrosis, cirrhosis, and carcinoma of the liver in a number of animal species; no animal species is resistant to the acute toxic effects of aflatoxins; hence it is logical to assume that humans may be similarly affected. A wide variation in LD50 values has been obtained in animal species tested with single doses of aflatoxins. For most species, the LD50 value ranges from 0.5 to 10 mg/kg body weight. Animal species respond differently in their susceptibility to the chronic and acute toxicity of aflatoxins. The toxicity can be influenced by environmental factors, exposure level, and duration of exposure, age, health, and nutritional status of diet. Aflatoxin B1 is a very potent carcinogen in many species, including nonhuman primates, birds, fish, and rodents. In each species, the liver is the primary target organ of acute injury. Metabolism plays a major role in determining the toxicity of aflatoxin B1; studies show that this aflatoxin requires metabolic activation to exert its carcinogenic effect, and these effects can be modified by induction or inhibition of the mixed function oxidase system. The outbreak may be seasonal, i.e., weather conditions may affect mold growth. The adverse effects of aflatoxins in animals (and presumably in humans) have been categorized in two general forms. A. (Primary) Acute aflatoxicosis is produced when moderate to high levels of aflatoxins are consumed. Specific, acute episodes of disease ensue may include hemorrhage, acute liver damage, edema, alteration in digestion, absorption and/or metabolism of nutrients, and possibly death. B. (Primary) Chronic aflatoxicosis results from ingestion of low to moderate levels of aflatoxins. The effects are usually subclinical and difficult to recognize. Some of the common symptoms are impaired food conversion and slower rates of growth with or without the production of an overt aflatoxin syndrome. In the United States, aflatoxins have been identified in corn and corn products, peanuts and peanut products, cottonseed, milk, and tree nuts such as Brazil nuts, pecans, pistachio nuts, and walnuts. Other grains and nuts are susceptible but less prone to contamination. The relative frequency of aflatoxicosis in humans in the United States is not known. No outbreaks have been reported in humans. Sporadic cases have been reported in animals. In well-developed countries, aflatoxin contamination rarely occurs in foods at levels that cause acute aflatoxicosis in humans. In view of this, studies on human toxicity from ingestion of aflatoxins have focused on their carcinogenic potential. The relative susceptibility of humans to aflatoxins is not known, even though epidemiological studies in Africa and Southeast Asia, where there is a high incidence of hepatoma, have revealed an association between cancer incidence and the aflatoxin content of the diet. These studies have not proved a cause-effect relationship, but the evidence suggests an association. One of the most important accounts of aflatoxicosis in humans occurred in more than 150 villages in adjacent districts of two neighboring states in northwest India in the fall of 1974. According to one report of this outbreak, 397 persons were affected and 108 persons died. In this outbreak, contaminated corn was the major dietary constituent, and aflatoxin levels of 0.25 to 15 mg/kg were found. The daily aflatoxin B1 intake was estimated to have been at least 55 ug/kg body weight for an undetermined number of days. The patients experienced high fever, rapid progressive jaundice, edema of the limbs, pain, vomiting, and swollen livers. One investigator reported a peculiar and very notable feature of the outbreak: the appearance of signs of disease in one village population was preceded by a similar disease in domestic dogs, which was usually fatal. 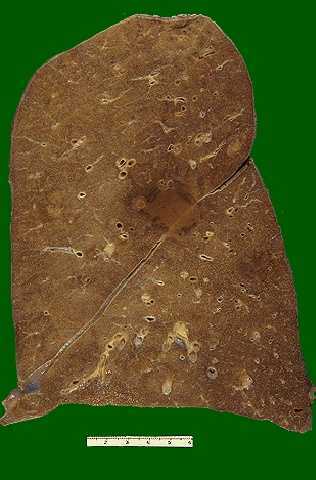 Histopathological examination of humans showed extensive bile duct proliferation and periportal fibrosis of the liver together with gastrointestinal hemorrhages. A 10-year follow-up of the Indian outbreak found the survivors fully recovered with no ill effects from the experience. A second outbreak of aflatoxicosis was reported from Kenya in 1982. There were 20 hospital admissions with a 60% mortality; daily aflatoxin intake was estimated to be at least 38 ug/kg body weight for an undetermined number of days. In a deliberate suicide attempt, a laboratory worker ingested 12 ug/kg body weight of aflatoxin B1 per day over a 2-day period and 6 months later, 11 ug/kg body weight per day over a 14-day period. Except for transient rash, nausea and headache, there were no ill effects; hence, these levels may serve as possible no-effect levels for aflatoxin B1 in humans. In a 14-year follow-up, a physical examination and blood chemistry, including tests for liver function, were normal. Although humans and animals are susceptible to the effects of acute aflatoxicosis, the chances of human exposure to acute levels of aflatoxin is remote in well-developed countries. In undeveloped countries, human susceptibility can vary with age, health, and level and duration of exposure. Otomycosis is a chronic condition that is found predominantly in tropical and subtropical regions and is rare in infants and children. Most infections are due to A. niger or, less commonly, A. fumigatus; coinfection with Staphylococcus aureus or Pseudomonas species occurs in one third of cases. Most cases are unilateral, and patients present with ear pain, itching of the auditory canal, and a sense of fullness. Otorrhea, decreased hearing, and tinnitus are less common. 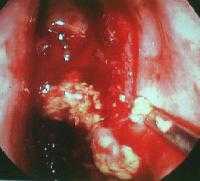 Examination of the auditory canal typically shows conidial “forests” or mycelial mats. Topical antifungal agents such as nystatin, tolnaftate, dilute acetic acid, and topical corticosteroids are therapeutic. Oral itraconazole has also been effective, but experience with it is limited. 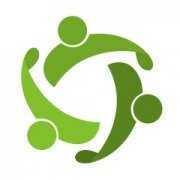 See Commonly used drug treatments for more information. A rapidly growing fungus that produces a bluish-green colony within ten days, when incubated at 25C (77F). It is a thermo tolerant fungus and is very common worldwide. It can be isolated from air, plants, foodstuffs, soil, sand beaches, caves and mines, activated sludge, mangrove swamps, fresh water, compost, animal dung, silage, fodder, and cotton fabrics in the tropics. It is one of the most common causes of systemic fungal disease in humans and animals causing acute or chronic respiratory tract infections. It is a well documented allergen. It is known to cause fungal balls/masses (grows in air spaces without invasion of tissue). Chains of 2-3 um spherical conidia philoconidia are borne from a single row for sterigmata that are produced only on the top half (non-radiate) of the vesicle (think of a person with greenish-gray hair that starts at the ears and goes up). Aspergillus flavus – the conidiophores are unpigmented, heavy walled and coarsely roughened-looks like a neck that needs a shave. Phialides cover the entire surface of the vesicle, pointing out in all directions and may be uniseriate or biseriate within the same colony but rarely occurs on the same head. Often associated as an aflatoxin (which is strongly associated as a carcinogen) producer. The major products in which aflatoxins are produced include corn, grain, soybeans, dry beans, cottonseed, grain sorghum, wheat, peanuts and tree seeds. The major types of Aflatoxins are B1, B2, G1, G2, and M1. Aflatoxin B1, a potent carcinogen to humans and animals, is the most toxic of its type. Damage to animal and human healthinclude acute toxicological effects such as liver damage and cancer. Aflatoxins can invade the food supply at any time during production, processing, transport or storage. Aspergillus niger – This is one of the most common and easily identifiable species of the genus Aspergillus, with its white to yellow mat later bearing black conidia. This is the third most common species associated with invasive pulmonary aspergillosis. It is also often a causative agent of aspergilloma and is the most frequently encountered agent of otomycosis. A. niger may also be a common laboratory contaminant. . Can cause severe hearing and, as the others, chronic neurological problems. May also produce fungal balls/masses. Conidiophores are biseriate producing long chains of globose conidia that are dark and echinulate (spiny). Aspergillus versicolor – Conidia dimensions are 2 – 3.5 microns. It is commonly found in soil, hay, cotton, and dairy products. This species is only occasionally pathogenic. It can produce a mycotoxin sterigmatocystin and cyclopiaxonic acid. The toxins produced can cause diarrhea and upset stomach. It is reported to be a kidney and liver carcinogen, as well. Based on counts of Aspergillus species reported in over 250 studies of microfungi from soils and litter, chi-square analyses were conducted on species occurrence in five biomes and five latitude ranges to determine variations from expected distributions. There was no overall trend in distribution of the members of the entire genus by biome, however, individual sections of the genus appeared to have distinct distribution patterns. Most members of sections Aspergillus, Nidulantes, Flavipedes and Circumdati occurred at greater than expected frequencies in desert soils. There was no distinct pattern of species occurrence for forest, wetland, or cultivated soils, although members of section Nidulantes were quite rare in cultivated soils. Most species occurred at or below expected frequencies in grassland soils. Members of the genus tended to occur at greater than expected frequencies at latitudes in the subtropical/warm temperate zone between 26 and 35 degrees. Most species occurred at expected frequencies in the lower latitudes, and below expected frequencies in latitudes greater than 35 degrees. The occurrence data and the results of the statistical analysis are presented infor the 52 species for which there were more than four reports. 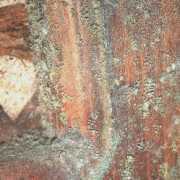 Five species were reported in over 100 studies, A. fumigatus, A. versicolor, A. terreus, A. flavus, and A. niger var. niger. With one exception, these five species occurred at the expected frequencies in all of the biomes; A. terreus occurred at greater than expected frequencies in cultivated soils and less than expected frequencies in forest soils. However, only two of these five species occurred at expected frequencies in all of the latitude ranges: A. fumigatus and A. versicolor. Aspergillus terreus and A. flavus were reported at greater than expected frequencies in the 26-35 degree range and at less than expected frequencies in one of the higher latitude ranges. Aspergillus niger occurred at less than expected frequency in latitudes above 45. Of the 52 species included in, 22 species occurred with greater than expected frequencies in desert soils, compared to 6 in forest, 2 in grassland, 11 in wetland, 8 in cultivated soils. The biomes with the lowest number of species occurring at less than expected frequencies were the desert and wetland soils (10 and 6, respectively), in contrast to 14-17 species in the other three biomes. In the tropical latitudes, 18 species occurred at greater than expected frequencies and 11 at less than expected frequencies in the 0-15 degrees latitude range, whereas 11 species occurred in each of those two categories in the 16-15 degrees latitude range. In the subtropical to warm-temperate latitudes between 26 and 35 degrees, 30 species occurred at greater than expected frequencies and only 3 at less than expected frequencies. At higher latitudes, the majority of species occurred at less than expected frequencies; 31 and 41 for the 36-45 degrees and 46 degrees+ ranges, respectively. Only 7 species occurred at greater than expected frequencies in the 36-45 degrees latitude range and only one species in the 46 degrees + latitude range. Not all subgeneric sections of the genus followed the overall trends. Although there was no strong overall trend for occurrence of all of the species in any one biome, there were trends for some of the sections within the genus. The xerophilic species in subgenus Aspergillus and many species in sections Nidulantes and Circumdati occurred with greater than expected frequency in desert soils. Unlike most species which occurred at greater than expected frequencies in the 26-35 degrees latitude range, most members of sections Cervini and Ornati occurred with greater than expected frequencies above 35 degrees, and most species in sections Flavi and Nigri occurred with greater than expected frequencies in the 0-15 degrees latitude range.